The title of this blog should make it clear. Klinsmann is and has been quite a divisive figure for the sport of soccer in the United States. His hiring came as no surprise in mid 2011 when Bob Bradley was let go after a disastrous showing in the Gold Cup. Klinsmann would remake Team USA and would give it the world presence it deserved. Klinsmann's tenure was rocky at first, with 3 losses and 1 tie in the first 4 games. After that came great showings in friendlies versus Italy, Mexico, and Slovenia, interspersed with lackluster performances in the beginning of the CONCACAF qualifying rounds. But Klinsmann pushed the envelope of what could be achieved. He got the most out of Altidore, and introduced and reintroduced players like Geoff Cameron, Mix Diskerud, John Brooks, DeAndre Yedlin, Julian Green and Joe Corona. He set a record for the USMNT in consecutive wins at 12, won the Gold Cup 2013, and delivered the U.S. to Brazil 2014. Up until the pre-World Cup friendlies, most things could be forgiven. And yet, there were fissures in his relationship with some of the players and, especially, with MLS. It started in August 2013 when Clint Dempsey made a surprise move to the Seattle Sounders. Klinsmann was not happy that his captain would no longer be playing in Europe. Michael Bradley's move to Toronto FC in January made things worse. Klinsmann was very clear in his disappointment. It was not competitive enough in MLS and their form would suffer. What really broke things for him with many fans was his exclusion of Landon Donovan from the World Cup team. Many, myself included, thought the decision would haunt him at the tournament. In a way, it did. Altidore's absence due to injury after the first game and an ineffective Brad Davis stick out as reasons the best player the U.S. has ever produced should have been a part of that squad. But Klinsmann's recent remarks about more players needing to be in Europe and MLS not being enough drew the ire of one Don Garber. Garber was rightly insulated by the coach's words on player development. But what is the real truth behind Klinsmann's divisive nature? Just ask the fans. Some argue that MLS is great, should be supported and is getting more and more impressive every year. The crowds in Portland and Seattle make this point clear. And then there is a vocal minority that sustains that the only worthwhile soccer exists in Europe, that Klinsmann is absolutely correct and that Michael Bradley needs to go back to Europe. 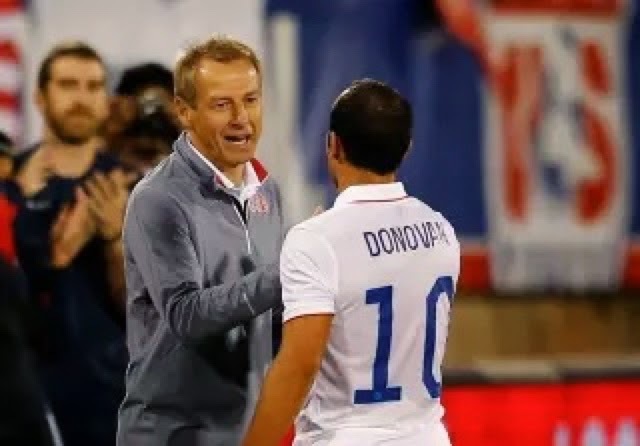 I heard this from a soccer fan in small town Florida: Klinsmann is right, MLS is not good enough, and, surprisingly, Landon Donovan isn't as good because he never played abroad. I suggested that he look at the statistics. Donovan has scored more goals than anyone else for the USMNT. So there it is. Surely, if you are a soccer fan in the U.S. then you fall under one of those two categories. You side with Klinsmann or you don't. Divisive indeed.